Hey guys! Welcome to another Friday Feels where I share what I’m “feeling” this week. 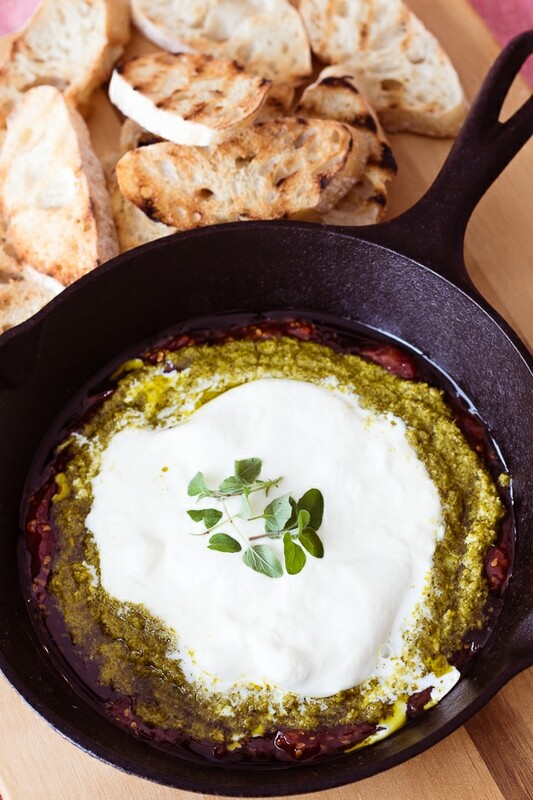 This week I’m sharing a fun and easy appetizer idea – Burrata Crostini with Tomato Jam and Pesto. It’s a recipe that I tried to recreate after eating at one of my new favorite restaurants here in Grand Rapids, MI called Mazzo. I have to get this appetizer every time we go there, because it’s that good. 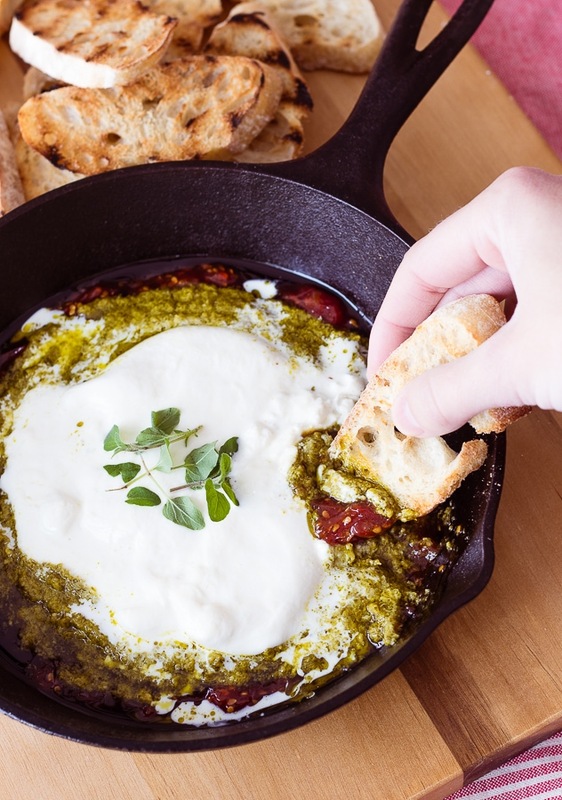 Tangy tomato jam, layered with fresh pesto, and topped with creamy burrata. Throw in some crusty bread and I don’t even really need dinner, I could eat this all night long. You could even make this super easy by buying your own tomato jam and pesto. I decided to try my hand at making the tomato jam, but took the easy way out and used Trader Joe’s pesto because I think it’s delicious and just as good as anything I would make myself. Burrata tastes best at room temperature, so be sure to set it out on the counter for a bit before serving. Or since I used a skillet as my serving dish, I popped this in the oven for a few minutes at 350, but it’s not necessary. You could even serve these up already put together if you don’t want a dip idea. Just top each individual slice of bread with the jam, pesto and burrata for an easy to eat party appetizer. Slice cherry tomatoes in half and put in a small saucepan. Add sugar, lemon juice, garlic powder, cinnamon, red pepper flake and salt and pepper. Bring to a boil, lower heat and simmer for 45 minutes- hour stirring frequently until it becomes thick and syrupy. Let cool, keeps for several days in the fridge if need be. Spread the jam onto a plate, serving dish, pan whatever you want to use. Add a layer of pesto. Grill or toast sliced baguette and dip into the spread. Check out more of my recipes here on my recipe page. Yum! Am going to try this out this weekend! I know what I’ll be making this weekend. I’ve got leftover tomato jam from making this earlier in the week so I’m making it again too, I hope you love it! What is burrito and where do you get it? Ha oh autocorrect :) It’s like a creamier version of fresh mozzarella, I get it at Trader Joes. It comes in a plastic container with 2 balls of it packed in liquid. I top this with one of the cheese balls and then kind of break it open a bit, it’s really creamy inside. I’ve also found it in my grocery store specialty cheese section where you would find fresh mozzarella, but I think this would be delicious with mozzarella as well if you can’t find it. Thanks Kelly…can’t wait to try it! OH it’s so yummy! I get mine right at Trader Joes but you can sometimes find it in the regular grocery store by the fresh mozzarella. If you can’t find it I bet this would be delicious with fresh mozzarella as well just not quite as creamy. Or maybe you could bake it longer so the mozzarella would get melty? I had to look up Burrata but now that I know what it is, I think I’ll try this. It’s very visually pleasing, especially in that cast iron skillet. Oh it’s so good! Basically fresh mozzarella but even creamier. This looks yummy. I had only heard of pesto…not tomato jam or the burrata. Lol! If I can buy it all at Trader Joe’s I will try it. My husband and I love appetizers for dinner. I like to make baked brie with pumpkin butter and pecans..wrapped in puff pastry. It is awesome! Kathy….do you have a recipe for this? It also sounds yummy! Thaw puff pastry. Spoon pumpkin butter on top of Brie. Sprinkle pecans on top of pumpkin butter. Carefully wrap pastry sheet around the Brie mixture, placing seams on the bottom. Beat the egg with water and brush on seams to hold them together. Also brush some egg wash over the entire pastry to help it brown prettier. Gently place pastry seam side down on baking sheet covered with parchment paper. Bake in 400 degree preheated oven for 25 minutes. Serve with crackers. This sounds delicious thanks for sharing Kathy! I have a Sprouts local, so I’ll try to find it there. This recipe sounds really yummy!! Love tomato jam and pesto. Not at all! I’ve seen it popping up on lots of menu’s here in Grand Rapids in the past year, but I didn’t know what it was before that either.